In Spanish, gordo means fat. 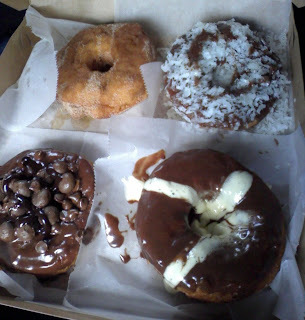 In South Austin, Gourdough's means big, fat, freakin' doughnuts!!! And you will not stay flaca by eating these masterpieces! Welcome to the newest Airstream trailer to hit South Austin. Does it get any better than hot doughnuts?? It's just before 3 pm on Thursday. I am with 3 work colleagues, and we are supposed to be someplace at 3 pm. 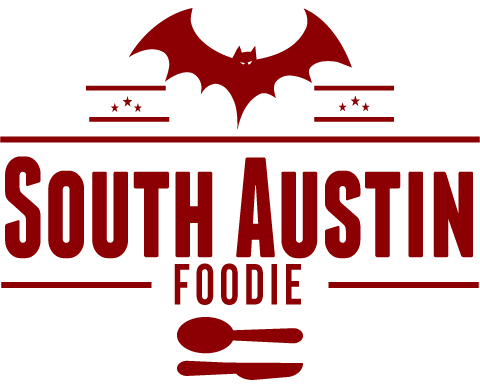 We heard rumors of a new doughnut trailer on South Lamar. Near Mary St? Near Treadwell? And it happens, that Lamar coincidentally is the road we need to travel on to get to our destination. And there it is. Just north of Genie Car Wash, before the light at Treadwell (when going north). I believe the trio of yard signs say "BIG", "FAT", "DOUGHNUTS." Screw the work appointment, we need fried dough! We pile back into the air conditioned car, as it's one of those hot & humid October days. And we wait. It took almost 20 minutes. But, the results were so damn worth it. 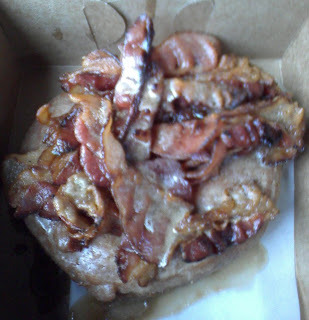 Being the sucker for bacon, AND for salty sweet things, I got the Flying Pig -- a hot doughnut with maple syrup icing and bacon on it. And I mean a crap-ton of bacon. There were probably 8 pieces of crispy goodness on my doughnut. Look at the picture with the box of four, from the top left going clockwise we have: Naughty & Nice (sugar & cinnamon), Sara's Joy (coconut filling w/ fudge frosting & coconut), Mama's Cake (yellow cake batter filling & chocolate frosting), and Black Out (death by chocolate). These pictures were taking in a moving vehicle as we were trying to figure out how to eat them. I don't recommend eating in the car, but some milk (which they sell) would have been great! It's a sugar-high experience, not to be missed! Get extra napkins too. So we arrive late to our work function, but fortunately, there's no punishment for those who bring doughnuts! Our event goes late, and at the end, the boss man wants to take us out for drinks. Who are we to argue! We meet at Justine's, the new cottage house French bistro in East Austin. Arriving around 10:30pm, the place is packed. There are several little tables outside, all of which are filled. We get some cocktails, and nibbles. Pomme frites, escargot, and house-made charcuterie, which included an incredible pork rillette, a mousse of duck and don't remember what, and a compagne, or country-style pate, that I think was also pork-based. The pate was lacking in flavor, but the rest of the appetizers certainly make me want to go back for a meal. Obviously this area was majorly lacking in a bar/bistro, and at just a month old, they seem well on track for success. 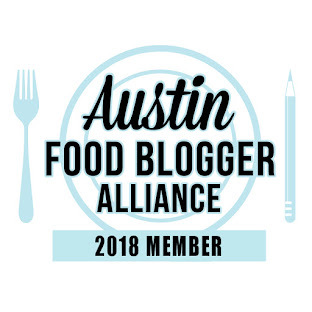 On another note, I couldn't find contact information anywhere on your site, but if you're interested in an event I'm putting together for food bloggers, please send your email/contact details to kerri.holden@fourseasons.com. Your photos look mouthwateringly good! I can't wait to make it over to Gourdough's. Thanks for the review.